Sehr interessantes Album, das häufig an Lenny Kravitz oder vor allem Prince erinnert. Ein Album, das man mit den normalen Worthülsen schwer zu fassen kriegt. Leider weiß ich nicht mehr, wich darauf aufmerksam wurde. Hatte es seit 16.12.116 in meiner Spotify-Playlist. Childish Gambino ist der Schauspieler, Komiker, Drehbuchautor, Musiker und Regisseur Donald Glover. 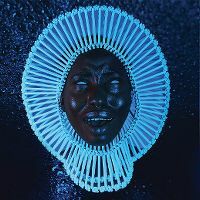 I was never a Childish Gambino fan, but as soon as I heard that he had ditched rap and pursued funk/soul, I was curious, and that curiosity was only heightened further when I heard the ripping first two singles from this project. In the end, I was a little disappointed. I mean, "Redbone" and "Me And Your Mama" are still utterly awesome and attracted me instantly, but elsewhere, there isn't all that much to lure me in. In saying this, there was nothing close to be bad, and everything was on the positive side of the ledger, but every other song on the album other than those two singles were pretty much all 6/10 songs for me. Altogether though, I really did like the album overall, and I hope that this is a sound that he keeps pursuing.